In the US, there are nine cities with more than 1m inhabitants. In China, there are 49. You can be travelling across China, arrive in a city that is twice the size of Houston, and think: I've never even heard of this place. That is how it is for many foreign visitors to Hefei (population 4.7m). I have been travelling to China as a journalist, or living here, for nearly 20 years and visited Hefei (pronounced Huh-fay) for the first time only last year for the book I have just written about the new China. There had never been any reason to come. But as in so many cities in China, the local government is trying to change that. After centuries of inland poverty, Hefei, like all Chinese cities, is opening up. In India, the cost of some restraint on the government is a slower growth rate. But at least independent trade unions are allowed in India, and some of them have teeth. India also has a free press, which can act as a watchdog on governmental bad behaviour. In China, the press is more free now on social and economic matters, but it can easily be muzzled by the government on any sensitive issue. In the end though, there is one crucial difference between China and India, and a perfect example of it is coated in black tarmac and runs east and west through Hefei. China is a brutal place to live if you are on the bottom rung, but there is an exit. And, just as important, there is a real possibility of a job at the other end. India's 1.1bn population is rapidly catching up with China's 1.3bn. But India has only about 10m manufacturing jobs, compared with about 150m in China. So there are simply more opportunities in China to improve your life. (And I haven't even mentioned India's restrictive caste system.) The growing service sector in India—in software development, in call centres and service centres—is great if you are already middle class and speak English. But what about possibilities for the hundreds of millions of illiterate peasants? It seems to me that India is trying to reach modernism without passing through the industrial revolution. Now, as the cost of manufacturing rises in China, we are starting to see some manufacturing relocating to India. The country's retail sector is opening up too, and India is in the midst of other major economic changes. So in the near future, more opportunities of escape from rural poverty may be provided, in which case the balance will tip in India's favour. I'm disappointed that one of the few Indians in central China does not want to have this conversation with me. So in the end, I have the conversation with myself over dinner, and I conclude that I do not want to be a Chinese peasant or an Indian peasant. But if I have to take a side, despite all the massive problems of rural China, I'll go for the sweet and sour pork over the chicken biryani. It is a fair bet that when the ruling elite of a poor developing country ignores a non-violent protest by 25,000 desperate citizens, it will soon face a violent one. When a 25,000-strong army of landless workers, indigenous tribespeople and “untouchables” from the bottom of Indian society marched 320km to Delhi to highlight the growing divide between haves and have-nots, they were met with crushing indifference. Admittedly, their timing was bad: Mumbai’s Sensex index on Monday punched through the 20,000 mark for the first time, triggering orgiastic self-congratulation by the English language media and eclipsing all other national news. “The first 10,000 took over 20 years. The next came in just 20 months. Superpower 2020?” rhapsodised the front-page headline of the Economic Times, the cheerleader for a phenomenon it calls the ”global Indian takeover”. In their excitement, several other newspapers double-counted the value of all Mukesh Ambani’s stakes in various listed Reliance entities and erroneously concluded that he had overtaken Bill Gates and Carlos Slim to become the wealthiest person in the world, with investments valued at $63bn. Although that joyous moment may not be far off – the elder Ambani is worth nearer $50bn – it has not come yet. As first-world India cheered the stockmarket, there was scarcely mention of the visitors from third-world India who had camped overnight in the old city. Feet swollen, mouths parched and hair matted, the protesters were physically detained in a gated enclosure throughout the day, denied the satisfaction of completing the symbolic last leg of their march down Parliament Street. The city’s police force had instructions to keep the capital spruce for visiting dignitaries, among them Angela Merkel, the German chancellor, Henry Paulson, US Treasury secretary, and dozens of chief executives in town for a lavish conference organised by Fortune. Tyler Cowen of Marginal Revolution is unimpressed by the paper by Northwestern University's Kripa Freitas on the Indian caste system that I posted about just over a week ago. Here are the key points from his post, Was the Indian caste system efficient? 1. No way should this paper spend so much time on a formal model. 2. The tests proffered on p.36 are related only tangentially to the paper's main propositions. 3. When it comes to normative issues, the author can do no better than to write: "This should not be interpreted as saying that the case system was free of inefficiencies." And that comes only on p.46. Ha! 4. The paper commits the fallacies of excess functionalism. 5. Virtually any destructive institution which keeps economic transactions on a smaller scale may make contract enforcement "easier" in some regards. 6. This is nonetheless interesting work, and many more people should do research on this and related topics. But in terms of emphasis this paper is way off base. Also worth reading some of the comments on this post. From his tree-top-high office, Kris Gopalakrishnan, the head of India's giant software company Infosys, explains the rise of an economic phenomenon about to engulf the world: outsourcers are outsourcing themselves. Once known for sucking jobs out of call centres and IT departments in the west, Indian technology firms are re-exporting them to wealthier nations as wage inflation and skills shortages at home reverse the process. Infosys spent $250m this year buying the Polish call centres of Philips, the electronics group, manned by workers who speak half-a-dozen European languages. The company is building up a network of offices stretching from Mexico to eastern Europe to China to provide an "anytime, anywhere" solution to its clients. "Our customers are global, so we have to become so," says Mr Gopalakrishnan. Infosys is not alone. Wipro, another hi-tech titan, has been on a spending spree, buying up companies in America, Finland, Portugal and Europe for hundreds of millions of dollars. Azim Premji, Wipro's chairman, raised eyebrows on Wall Street when he talked this year of setting up divisions in Idaho, Virginia and Georgia - US states he said were attractive because they were "less developed". Tata, India's largest firm, is running call centres in Britain. ABN Amro, the Dutch bank recently bought by an RBS consortium for £48bn, will pay Tata Consultancy Services $200m to send work halfway across the globe to Brazil, where software programmers will run computer systems. Indian software companies' skill is that they have been able to take complex tasks from multinational firms, pull them apart and put them together more efficiently. This expertise has reached a stage where it can be done anywhere across the globe - grafting Indian technical knowhow onto white-collar workers in Brazil or Saudi Arabia or even back to the US. The persistence of this system of social stratification for 3000 years of changing economic and social environments is puzzling. This paper formalizes a model of the caste system to better understand the institution and the reasons for its persistence. It argues that the caste system provided a tool for contract enforcement and facilitated trade in services, giving an economic reason for its persistence. A caste is modeled as an information-sharing institution, which enforces collective action. Trade is modeled as a version of the one-sided prisoner’s dilemma game, where the consumer has an opportunity to default. Consumers who default on a member of a caste are punished by denying them services produced in the caste. Various features of the caste system like occupational specialization by caste, a purity scale, and a hierarchy of castes are shown to be equilibrium outcomes that improve the efficiency of contract enforcement. The implications of the model are tested empirically using unique census data from Cochin (1875), Tirunelveli (1823) and Mysore (1941). India's Congress-led government has told companies to hire more dalits and members of tribal communities. 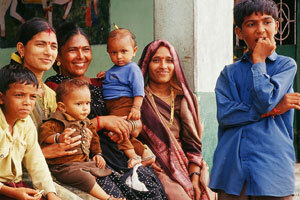 Together these groups represent around a quarter of India's population and half of its poor. Manmohan Singh, the prime minister, has given warning that “strong measures” will be taken if companies do not comply. Many interpret that to mean the government will impose caste-based hiring quotas. Quotas already apply in education and government, where since 1950 22.5% of university places and government jobs have been “reserved” for dalits and tribal people. In addition, since 1993, 27% of government jobs have been reserved for members of the Other Backward Classes (OBCs)—castes only slightly higher up the Hindu hierarchy. This is not enough for supporters of reservations. Since the introduction of liberal reforms in the early 1990s, public-sector hiring has slowed and businesses have boomed. Extending reservations to companies, they argue, would therefore safeguard an existing policy of promoting the Hindu wretched. It would almost certainly require changes to the constitution. But low-caste politicians are delighted by the prospect, so it could happen. The chief minister of Uttar Pradesh, a dalit leader called Mayawati, has said 30% of company jobs should be reserved for dalits, members of the OBCs and high-caste and Muslim poor. Chandra Bhan Prasad, a dalit journalist, applauds this and argues that it would be in the interest of companies. “It is in the culture of dalits that they are least likely to change their employment because they are so loyal to their masters,” he says. It would also help them become a “new caste [sic] of consumers”. But is there a problem? 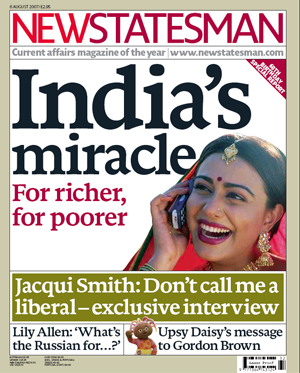 the September issue ..marks the 60th anniversary of Indian independence by asking an uncomfortable question of India’s new middle class - why is it so uninterested in politics and social justice? In our cover story, Chakravarthi Ram-Prasad argues that aspects of India’s history and culture have helped shape a middle class - easiest the biggest in the world - that is largely apathetic about politics and the 300m Indians living in extreme poverty. Ram-Prasad argues that although "there are now effective movements of marginalised groups and opportunistic social coalitions in many states", until the middle class begins to engage politically, India will suffer from a lop-sided modernisation. It's an interesting read. I attach a PDF version. Also worth reading are the comments on the weblog post cited above. * In Moving on, Sandy Howard explains how Delhi's transport captures the divide between rich and poor. For India's newspapers and television, the country's story is of a resurgent nation of 1.1 billion people taking its rightful place in the new world order. Daily headlines in the capital, New Delhi, highlight the runaway stock market, Bollywood's soft superpower and India's 36 dollar billionaires - more than in any other Asian nation. ...There is little doubt that India is experiencing a rapid and sustained rise in living standards for the first time in centuries. Growth has averaged 8 per cent since 2003, second only to China. According to the investment bank Goldman Sachs, India's young population gives it the potential to grow faster than China in the long term. For many Indians this is exhilarating stuff: in the 1970s the country threw out Coca-Cola and IBM and sealed itself off from the outside world. Heady stuff, but ultimately economic folly. Growth slowed to 1 per cent a year - at that rate it would have taken 70 years to double incomes. Tentative reforms began in the 1980s, but it took a balance-of-payments crisis in 1991 for the government to usher in unexpectedly brave changes. Today, India's outward-looking, hypercompetitive policies as well as the trend towards smaller families mean incomes will double in a decade. Yet it will remain a poor country. Last month, government figures showed that malnutrition is endemic, with about 46 per cent of children aged three or younger underweight and almost 80 per cent anaemic. Less than 50 per cent of women can read or write their name. Only a third of homes have a toilet. The country is probably the world's largest Dickensian paradox - having both the best and the worst of times. The puzzle is that India is economically confident, yet sunk in interminable poverty. This is because most Indians live in a vast rural, feudal darkness and only a lucky few are part of the shining new future. Services, essentially white-collar work, makes up more than half of national income. But this does not mean that tens of millions of Indians sit behind terminals talking to someone in New York or London. Information technology, the poster-boy industry of India's economy, employs just 1.5 million people - a mere drop in the labour pool of 470 million. Even worse, only 35 million people in India have any sense of job security and 20 million of those work for the government. The rest of the working population - some 435 million people - are part of "the unorganised sector": toiling on the land, or driving a taxi, or running a chai stall, or working as menial household labour. In India, growth has been largely jobless. Historically, dynamic economies have relied on industry to fuel growth. In China, this led to millions of people leaving the land to work in factories. But during the 1990s, industry actually shrank as a proportion of the Indian economy. There is rural migration, too, where the sons of tillers leave to eke out a precarious existence as security guards and drivers in the big cities. The problem is reaching crisis point. Each year another ten million people enter the job market. To soak up the labour, India will have to build up its manufacturing sector quickly. This might sound like a return to the past - India's first prime minister, Jawaharlal Nehru, wanted his country to rush towards industrialisation. In some ways, the present strength of the currency, which is now hovering just above the symbolic Rs40:US$1 mark, is an enviable problem. It suggests that the country's attractiveness to foreign investors is increasing and signals optimism about the Indian economy more generally. ...the rupee's appreciation has benefited the economy by making imports cheaper. This is no small benefit--containing inflation has been high on the policy agenda during the past year, as the annual inflation rate (as measured by the point-to-point change in wholesale prices) rose to 6.1% in January 2007, compared with 4.2% a year ago. The inflation rate has subsequently moderated. This may offer the RBI some comfort in its battle against inflation, but the bank's new, stricter inflation target (4.5-5% in 2007/08, down from 5-5.5% in 2006/07) suggests that there will be one more increase in interest rates by the end of 2007. Why is the currency so strong? The main reason for the rupee's appreciation since late 2006 has been a flood of foreign-exchange inflows, especially US dollars. The surge of capital and other inflows into India has taken a variety of forms, ranging from foreign direct investment (FDI) to remittances sent home by Indian expatriates. In each case, the flow seems unlikely to slacken.